Nearly eight in 10 of the nation's smallest companies (79%) say marketing is a major success factor for their business and nearly one-half (46%) of such firms, or microbusinesses, say they are using some type of social media for marketing, according to a survey from Vistaprint. Microbusinesses, small firms with 1-10 employees, are typically local, and have fewer than 60 customers. Such firms account for an estimated 95% of all US businesses, or some 26.5 million companies. 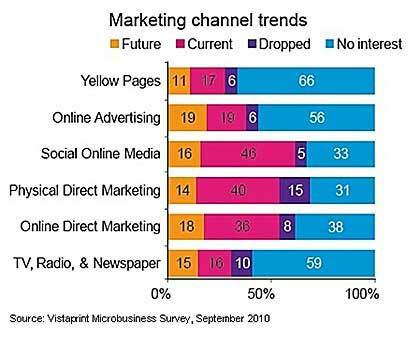 Traditional direct marketing is still important to microbusiness owners: 40% say they use the channel, followed by online direct marketing (36%) and online advertising (19%).